6 More Ways To Kick Your Workout Up A Notch With Coffee! Kick up the flavor of your next meal by trying one of these coffee-inspired recipes! Don't relegate the sweet notes of cocoa, rich aromas, and kick-in-the-pants flavor of coffee to liquid form. For a quick pick-me-up at any time of the day, try one of these coffee-inspired recipes, and eat your way to more pep in your step. Just be careful not to enjoy a caffeine-packed treat too close to bedtime, as it may keep you up longer than you'd like. Apply this rub to your favorite cut of chicken, beef, or pork, or sprinkle on eggs or veggies for a hit of feel-good flavor! Rub it in with your fingers to be sure it stays on during cooking. Apply this buzz-worthy barbecue sauce to grilled meats like pork tenderloin, or mix it with sliced rotisserie chicken for a zesty sandwich filling. This make-ahead stick-to-your-ribs breakfast will let you get out the door in short order with the kick and nutrition you need to tackle your day. The dynamic trio of carbs, protein, and fluids makes spooning up this deliciously thick smoothie bowl a perfect way to build yourself back up after a demanding workout. Be careful if you work out in the evening, though, as this bowl of goodness will give you a kick in the pants and may interrupt your usual sleep habits. Here's a good example of how a dessert can taste great but still play by the nutritional rules. Look for bottles or cans of prepared, unsweetened cold-brew coffee in most supermarkets, or brew your own coffee and let it chill before using. 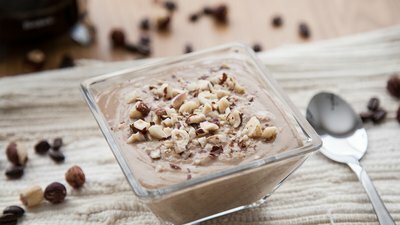 This fired-up nut butter is ready to make toast, crackers, sliced apples and smoothies that much better. It's the perfect pairing to a late-afternoon snack to help you power through the last few hours of your workday.